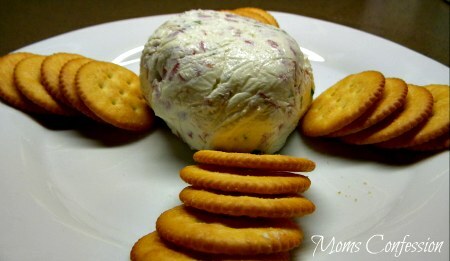 Cheese ball recipes are a dime a dozen across the internet. For our family, recipes not only have to be easy to make…they have to also fit our families frugal budget. This is one of those recipes that fits all of the above and can’t be kept to yourself! Share with everyone at you next backyard barbecue or family get together and be the talk of the party. Don’t be surprised if everyone keeps begging for more! Just make sure you make enough for all your guests! 😉 Enjoy! Mix all ingredients together in a bowl until well blended. Spray baking spatula and a piece of cling wrap with cooking spray. Using baking spatula remove mixture from bowl and place on cling wrap. Fold cling wrap around mixture and roll into a ball, place in refrigerator for 30 minutes. Remove from cling wrap and serve with Ritz crackers. Kristi divulges her favorite household tips and fires up the stove to share fabulous family recipes at Moms Confession. She lives in her flip flops year round with her husband and two preteen boys in Houston, TX. Strike up a conversation on Facebook and share your favorite recipes with her too! some of the meat in little squares and roll the cheese ball in it. It is delicious . I make this too but I add green olives with pimento in it, yummy!